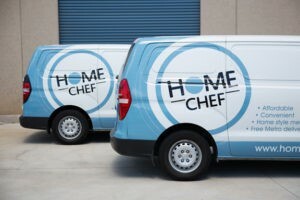 Home Chef employs their own delivery drivers who are required to have a national police clearance. Frozen meals are delivered in polystyrene boxes packed with ice packs, which has proven the most efficient, constant temperature of delivery. Drivers maintain a satisfactory standard of personal hygiene practises and follow the health and hygiene requirements prescribed under the Food Safety Standards and outlined in the Food Safety Program. Drivers wear a home chef uniform and have name badges. Food transport eskies are kept in clean and sanitary condition before use. Food transport vehicles are kept in a clean condition and maintained at a high standard. All meals are kept under strict temperature controls during delivery to prevent the growth of food poisoning bacteria.